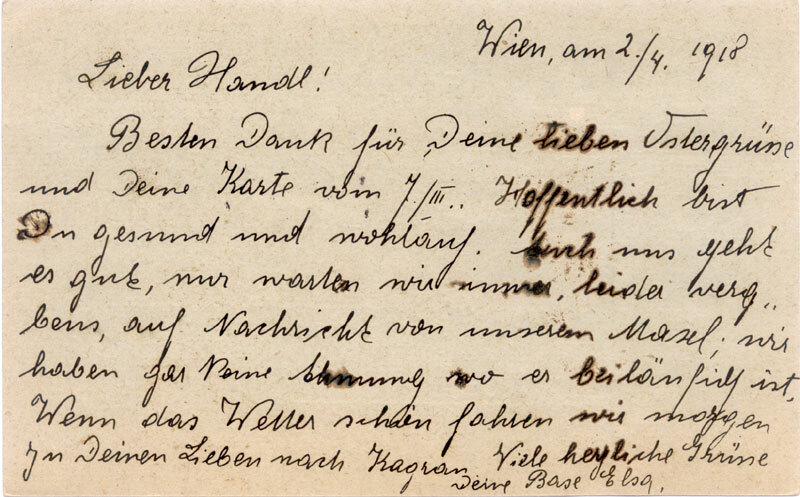 Two Feldpost cards were discovered in an accumulation, with cancels that "looked pneumatic"; so it was asked "why?" and as a supplementary "and how during WWI did mail get from Vienna to and from the Front?". 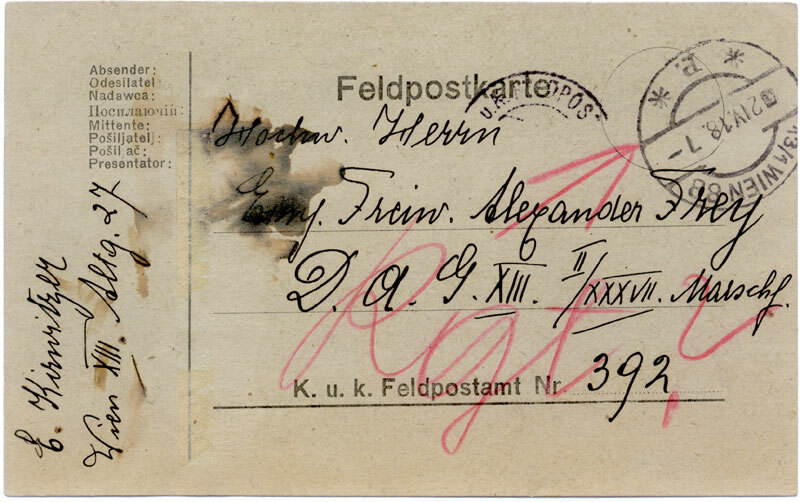 Both cards were sent from Vienna; a grey to the field and a deep red to a domestic address in Hungary. Both are in good condition and show no signs of the characteristic folding of mail carried by the pneumatic post. This card was posted to FPA392 on 2 April 1918. It has a Rohrpost cancel from Hietzing, 13/1 WIEN 88 /¥2IV.18.7- / * P. * (where "¥" is a solid square) of a type noted by both Tobitt/Taylor and Stohl. 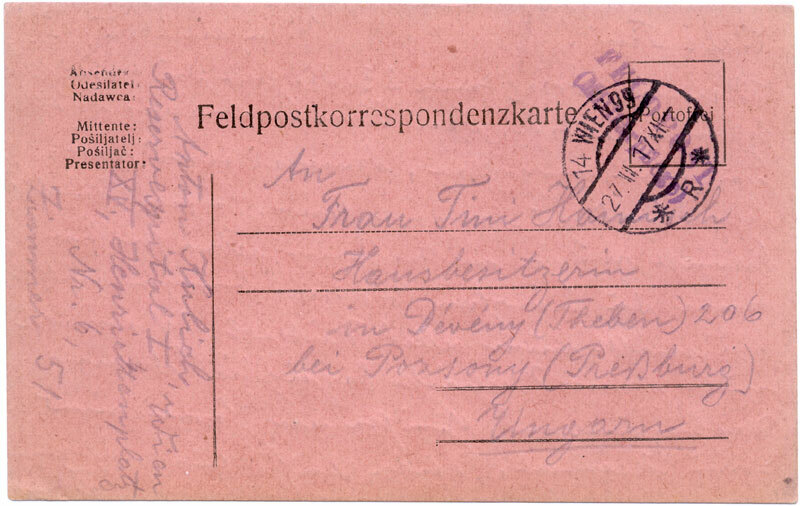 There is a small part of a KuK Feldpost cancel, and a red scrawl "Regt ?" with an arrow pointing to the Hietzing cancel. There is no reason for this to use the pneumatic system, and no evidence that it did. The card is addressed to a volunteer soldier: Hochw. Herrn Eing. Freiw. Alexander Frey, at some sort of unit at field post office 392. Herr Frey’s ‘rank’ is Einj. Freiw., that is Einjahr Freiwilliger (One year volunteer.) Men with a certain level of education were permitted to volunteer for one year's service to fulfil their military obligation. Soon after the Austro-Hungarian authorities realised that the war would not be a short affair, the terms of enlistment for a volunteer were changed to "the duration of the conflict". "Marschf" means "marching formation", ie a unit heading towards the front to relieve or reinforce those already there. The sender has omitted which regiment it is. The red crayon is "Regt? ": FPA 392 (or a previous step in the chain) has sent it back to Wien 88 to get the missing part of the address. FPA 392 was at this date with FsABaon 1, a regiment of artillery in the area of Bruneck in Pustertal, Süd-Tirol (according to Dixon-Nuttall). Its Marsch-formations are not listed explicitly. Neither of the Roman number "fractions" is in a format corresponding to any postal marking; in particular "6/XIII" is not a Tarnstempel. In a collection of over 200 covers with marsch unit cachets, the overwhelming majority use Arabic numerals for the company and roman numerals for the battalion. There does not seem to be any difference by date of usage. A few are found with all Roman numerals - perhaps someone thought that Roman numerals added a bit of class to the cachet! Herr Frey's address is D.A.G., that is Division Ausbildungs Gruppe (Divisions training group), XIII. As the war progressed and warfare became more technical, many Austro-Hungarian divisions, corps and even armies instituted special training organisations for the newly arrived replacement (marsch) companies and battalions. Before commitment to battle, the marsch units were sent to the training groups for the latest in tactics training. In the case of Herr Frey, this was the division's training group for the XIII (13th) Schutzen Division (with peacetime HQ in Vienna). In June 1918, 13th Schutzen Division was assigned to XXIV Corps, 6th Army on the Isonzo Front. Perhaps in April they were undergoing pre-deployment training in Pustertal. The address also includes II/XXXVII Marschs., that is the 2nd Marsch company of the 37th Marsch Battalion. This was the 37th replacement formation sent to a regiment of the 13th Division since the beginning of the war. In June 1918, the division had assigned to it Schutzen Regiments 1 (recruiting area Vienna), 14 (recruiting area Brunn, Moravia), 24 (recruiting area Vienna), and 25 (recruiting area in Kremsier, Moravia). Marsch (Replacement) battalions were sent to infantry regiments (K.u.k., or Landwehr/Honved/Schutzen) by the regiment's depot. An example of the complete designation for such formations was "k.u.k. infanterie-regiment hoch-und-deutschmeister nr. 4, ii/xviii marschkompagnie." That is Marsch Company Nr. 2, XVIII Marsch Battalion, K.u.k. IR Nr. 4. This was the 18th replacement battalion sent to K.u.k. IR Nr. 4 from the regiment's depot. Planning in 1914 called for one replacement battalion per month per regiment. One can calculate that this battalion was sent about December 1915. With all this information, it seems a bit strange that the feldpost officials couldn't locate Herr Frey simply because he forgot to include his regiment number. Aside: why "K.u.k" – how does that differ from "K.k."? See here! One can only guess at the size of the replacement units by referring to the standard size of regular infantry units. Until the Army reorganisation of 1917 all K.u.k., Landwehr, Honved and Schutzen infantry regiments were organised on the "Principle of 4", four sections to a platoon, four platoons to a company, four companies to a battalion and four battalions in a regiment. Wartime strength for an infantry company at the beginning of hostilities was 250 officers and men, so a battalion numbered 1000. A regiment was 4600, the 600 additional to its battalions being medical, supply, communications, etc. The replacement personnel were probably not counted against the regimental strength until they were actually assigned to their ultimate unit. During the army reorganisation of 1917, infantry regiments were reduced to three battalions. The extra battalions were used to create new regiments. At the same time additional machine gun, technical and infantry gun personnel were added to the regiments. Why the Rohrpost cancel? Perhaps because the sender put it in the wrong letter box, although it is also conceivable that some other cancel was being repaired and this was a substitute. Why is the bottom of the field post cancel cut off, and straight? Most probable is that they had a stack of items to receive a return impression, and lined them up overlapping to make less work. Less likely is that they had applied a little sticker with "Retour"; the sticker had part of the cancel on it and was later removed (there’s no trace of this). 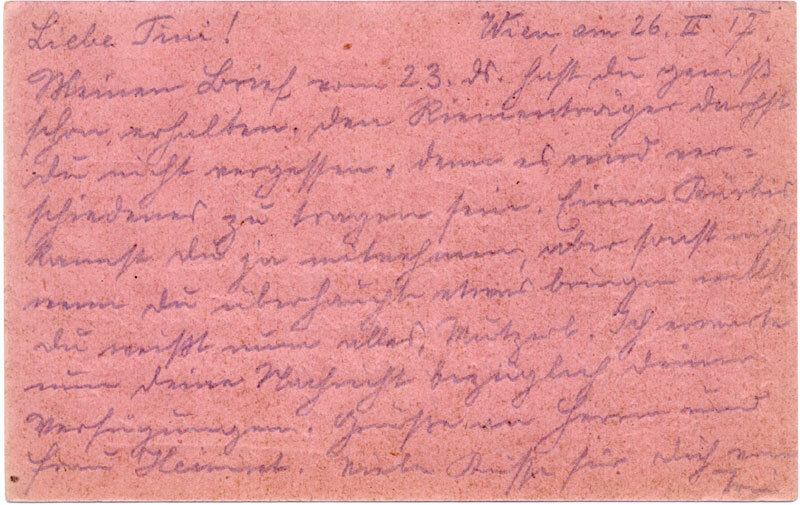 This deep red card was written on 26 Feb 1917 by Anton Kublik who is in Room 51 in Reservspital I, Henriettenplatz 6, Wien XV (so he’d be entitled to use Fieldpost) to a lady in Theben bei Posony, Hungary. The cancel is 14 WIEN 99 / 27.II.17XI- / * R * with a dash where the minutes could go. It is of a pneumatic type; but Wien 99 was never pneumatic: nor was this card. According to Schanzer, some R cancels were for Reklam (ie slogan cancels); there isn’t one for Wien 99 listed in Stohl as far as we can see. Schatz-by-Görig has a 14 Wien 99 R; but made in 1926 (maybe as a replacement). So, this cancel could have existed (ie it isn’t faked); and it exists used (here! ); but the card had no reason to use the pneumatic system; and there is no evidence that it did. The primary source here is page 43 of "E-47: Dienstbuch der K.u.k. Feldpost, Wien 1913". See also (a) Clement, Band 2 pp 347 & 407-8 [APS Lib 11b]; (b) Ferchenbauer, Band IV p 74ff [APS Lib 41]; (c) The Austro-Hungarian Army 1914-18 by John Dixon-Nuttall. The key question here is "where is Field Post Office nnn? ", to which Gefreiterunbezahlt Jones would tell his relatives to send his mail. As his unit’s name also appeared on the mail, Field Post Office locations were a Military Secret. The answer was the Postsortierstelle (the fieldpost sorting centre), entrusted with the key information, ie which FPOs were served by which Postsammelstelle (the fieldpost collecting centres). This list was issued and presumably updated by the General-Feldpostdirektion, which was part of the General Headquarters (AOK is Armee-oberkommando). This was initially located at Vienna, but moved several times during the war, ending up in Baden bei Wien. The Postsortierstelle were located at Army District Command Headquarters, including Brünn, Czernovitz, Graz, Innsbruck, Kassa, Klagenfurt, Knin, Kolozsvar, Laibach, Linz, Nagyvarad, Oderberg, Pecs, Pozsony, Prag, Sarajevo, Schönbrunn, Sopron, Tarnow, and Temesvar. Permitted: all normal letter-mail; registered items from 1 Oct 1918; value-letters up to 1000Kr; printed matter up to 2 kg; sometimes packets. This was allowed in both directions and could at all times include all normal letter-mail (letters, cards, printed matter, newspapers, trade samples and business papers); registered items; declared-value letters; and packets up to 5 kg. Article by AT and KB with much valued assistance from GM, HP, and TC.